To be a disciple of Jesus Christ is to be Jesus Christ is to be in a position of priviledge and blessing beyond anything the world might offer, begins author Jeremy Walker. 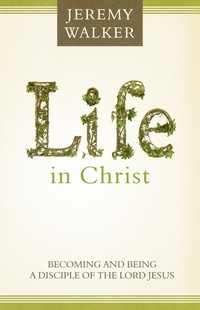 Life in Christ explores the unsearchable riches the Christian pilgrimage and traces its trajectory, highlighting key elements in the believer’s experience. Do you wrestle with assurance? Have you grasped the engagement demanded in Christian living? Do you find the way wearying at times? Do you struggle with your Christian identity? Walker provides instruction for Christians to assess their own standing and progress in the faith-exhorting and equipping and always pointing them ahead to the hope of Christ’s glory. Along the way, he encourages God’s people to live a life to the praise of His glory as he examines some basic truths that establish and direct a true child of God.